We knew some of you will be interested to read this recent obituary (originally published in the Herald Scotland) about one of our main film characters, Ian, who sadly passed away recently. The death of Ian Guthrie has robbed his family and friends of untold colour and humour, for his was a powerful presence that enriched any occasion, whether a social gathering to mark the birthday of a grandchild or a trip to the pub for a few steadiers and a diatribe about the latest instance of political incompetence, corporate malpractice or sporting controversy. But Ian would not approve of our indulging in prolonged sadness at his passing. He was an unsentimental man who towards the end of his life gave little impression of harbouring regrets or the sense that his had not been a life lived to the fullest. 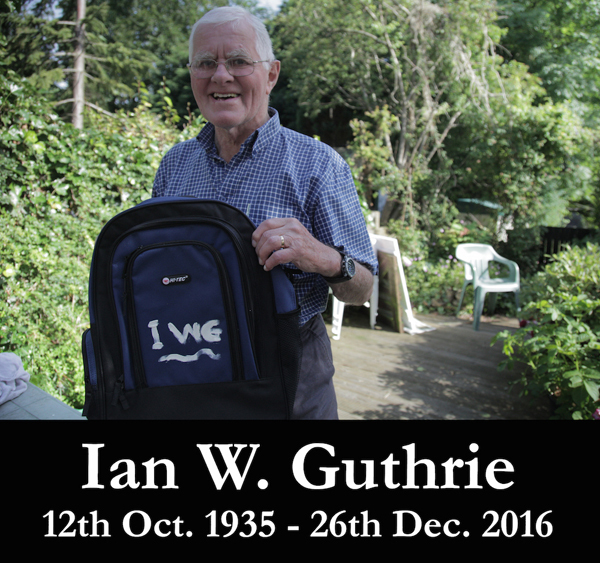 Ian William Guthrie was born in Falkirk on October 12, 1935, to Bill, a civil engineer, and Alice, a schoolteacher. He and his younger brother Derek led a nomadic childhood due to their father’s reserved occupation as a civil engineer, spending time during the Second World War in Northern Ireland, where he witnessed first hand the Belfast Blitz of 1941, before moving to Edinburgh and then Glasgow. Ian was educated mainly at Glasgow Academy where he discovered a passion for rugby which was not only to stay with him until the end of his life but also strip him of his two front teeth. Many years later he would recall having a young Donald Dewar, Scotland’s inaugural first minister, as his “fag” or personal servant, though his assessment of Dewar’s competence as both a politician and a lackey does not bear repeating here. After leaving school Ian undertook national service as a submariner with the Royal Navy, serving principally on HMS Andrew, an experience he enjoyed to such an extent that he stayed on beyond the mandatory 18 months. As recently as April 2016 Ian fell into hysterics as he recalled an episode involving the overconsumption of beer on shore leave and the consequences within the cramped confines of the submarine. The next chapter for Ian was an undergraduate degree at Cambridge University’s Emmanuel College. By Ian’s own admission his focus was somewhat lacking on the educational side of his time at university but on the plus side his social and sporting skills flourished. Ian took to rowing as effortlessly as he had to rugby, holding the uppermost position of stroke, and more than 20 years later would thrash the rowing machine in the family home as he got into shape for his latest challenge. After Cambridge and as the 1950s gave way to the 60s Ian returned to Glasgow, where he began training to become a chartered accountant with Peat Marwick. It was at this time that he was introduced to a young nurse from the Ayrshire coast, Ann Kirkland. Frustratingly, Ann was due to emigrate to Canada with her friend and fellow nurse Jean Dyer, the aim being to advance their careers and have new experiences. Despite Ian’s attempts to dissuade her, Ann duly departed Scotland but was soon doubting her appetite for the life she had dreamed of. Following the exchange of a series of transatlantic love letters the couple were reunited in Scotland and in 1963 were married in Overton Church in West Kilbride. As part of Ian’s training the couple moved to Bad Soden outside Frankfurt in West Germany, where they made lifelong friends and took full advantage of the proximity to excellent skiing runs. In 1966 they welcomed into the world their first child, Mark, and less than two years later they had a daughter, Alison. With Ian’s foreign posting complete the family moved back to Scotland in 1969 and chose as their base the town of Largs, which Ian and Ann saw as the ideal place to bring up their children as well as within commuting distance of Glasgow for Ian’s work. A second daughter, Karen, was born in 1970 and another son, Sean, arrived in 1971. For the ensuing decade or so Ian focused on what he deemed the main priority of a father, providing for his family, while remaining attuned to the importance of keeping active through playing rugby for his beloved Glasgow Accies, golf and most significantly running, culminating in his completion of the Glasgow marathon in 1982 at the age of 47. He would often engage his children as anchors for his feet while he performed sit-ups after an early-morning or evening circuit of the streets and promenade of Largs, the false teeth waiting to be reinserted after a cleansing shower. In line with Ian’s straightforward tastes (black coffee, liquorice allsorts, mince and potatoes, oatcakes) his reward after a Saturday-morning run would be fresh grapefruit, a couple of boiled eggs and a slice or two of toast. Alongside such virtues as self-reliance and perseverance, Ian saw it as his duty to instil in his children an appetite for sport and outdoor activity. In life, as on the pitch or track, a few scars and sprains were inevitable and it made sense to get used to the fact. His success in this regard was nevertheless slow to manifest itself on occasion. Of his four children with Ann only Sean succumbed to his father’s efforts to introduce them to the appeal of golf. Likewise, although Ian would blithely lead his brood up hills while on holiday in Scotland, the Lake District and Yorkshire, promising the reward of half a Polo mint to those who made the summit, it would be some time before any of his children rediscovered a latent interest in hillwalking. That said, Ian’s children have all taken to sport and making the most of all that the outdoors has to offer, so their father’s persistence paid off in the end. In the early 1980s, a period in which he served as secretary of the Largs Viking Festival, Ian became disenchanted with accountancy and worked for a spell in life insurance, but the offer of a position as a financial director of a shipping firm in the tiny east African country of Djibouti was too good to pass up, especially with the looming prospect of funding further education for four children. In 1983 Ian left for Africa and for the next decade returned twice a year, finding his sons and daughters developing as children do. Mark and Sean went to Glasgow University, Alison enrolled at St Andrews University and Karen went to Edinburgh College of Art. In the days before student loans Ian’s salary played a crucial part in seeing his children through their studies. It was upon Ian’s return to Largs from Djibouti that he revealed to Ann and his children that during his time in Africa he had fallen in love with an Ethiopian woman called Tadalech and they had a son, then aged four, called Campbell, who lived with his mother in the Ethiopian capital of Addis Ababa. Ian also insisted that he wished to remain Ann’s husband while planning for a future for his youngest boy in Scotland and ensuring Tadalech and her extended family were financially secure. During the years that followed – in which Ian and Ann separated and eventually divorced but remained interdependent, and in which Ian strived to establish a sound upbringing for Campbell – Ian never shirked from the complexities to which his choices had led. His decisions were not always universally popular but he stood by them and did what he thought was best. Around this time Ian and Ann became grandparents, first to Alison’s daughter Zoë then to Alison and Joe’s children Emma, Mia, Adam and Lila. Ann was known to them as Nonna while Ian was Papa, a benevolent figure whose idiosyncratic generosity revealed itself in the form of unpredictable birthday gifts and donations of loose change for the buying of sweets. Ian never expressed a hankering for retirement and continued to work well into his seventies, looking after the accounts for a haulage firm in east London. Not that he would enjoy the fruits of his labours himself, making the weekly return trip south from Scotland by the cheapest means possible, i.e. the night bus, aided and abetted by a couple of steadiers and a carefully filled hip flask. When Ann became severely disabled following a stroke in 2008, Ian in time assumed a central role in the elaborate system of care she required in her home in Largs, as documented by Karen in her film The Closer We Get. Ian was a pivotal presence towards the end of Ann’s life, elevating her mood while also ensuring she was comfortable in between visits from her carers. During this time Ian began accompanying the Largs Rangers Supporters Club as the Ibrox side embarked on the process of rebuilding after having been demoted to the lower leagues as punishment for entering liquidation. Earning himself the nickname The General due to being the most senior member of the cadre, Ian found relief from his caring responsibilities through travelling to many of Scotland’s less august football venues to watch Rangers climb through the leagues, though his travels were not without incident. Indeed, having become somewhat over-refreshed he was once left behind by the club bus in Cumbernauld after an away game against Clyde and only made it back to Largs thanks to his sister-in-law Judith Duffield pulling significant local strings. Having visited Ethiopia regularly since coming back to live in Scotland, Ian returned in 2012 and fulfilled a long-held promise to marry Tadalech. Following Ann’s death Ian moved into sheltered accommodation a few hundred yards from the home of Alison, Joe and their children in Govan. Ian became a de facto member of the household and drew fathomless pleasure from gently winding up the younger children and generally geeing everybody along with endless bon mots and fantastical stories, such as his having been a Harley Street doctor until he was struck off, or having taught Rudolph Nureyev everything he knew. Ian understood life, and the fact you shouldn’t take it all that seriously. He also took full advantage of his return to the city in which he had studied and worked, journeying into the city centre on a weekly basis for a few steadiers in the Press Bar with former colleagues of his son Sean, now a journalist with The Herald. He enjoyed observing if not always approving of the changes that had taken place in the city since he was a boy as well as paying regular visits to Govan library. Ian’s health began to falter last June when he was diagnosed with jaundice. He recovered but then suffered a couple of strokes which stole from him his excellent verbal dexterity, and his frustration was impossible to overlook. Without conversation, without humour, his quality of life was much diminished. Each of us will have our own particular memories of Ian, and we should hold them close to our hearts. Whether hectoring the Scotland rugby team on TV from his armchair, lapping up even the briefest spells of sunshine wearing his preferred trouser style of tailored shorts or preparing brandy butter at Christmas, Ian Guthrie was a force of nature. He will be profoundly missed. Ian is survived by his wife Tadalech, children Mark, Alison, Karen, Sean and Campbell, and grandchildren Zoë, Emma, Mia, Adam and Lila.